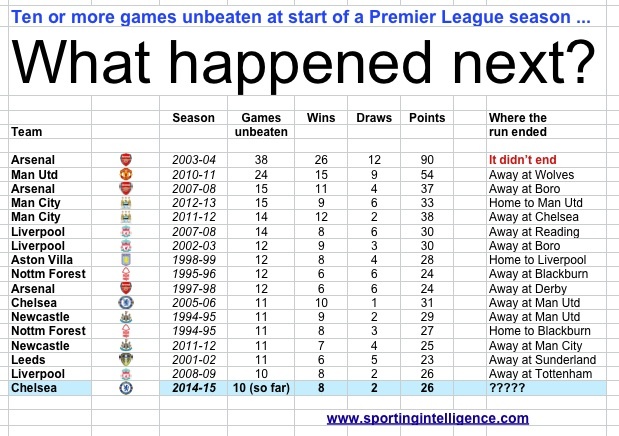 HomeFootballNewsChelsea’s 10 unbeaten games keeps them on Invincibles course …. Chelsea’s 10 unbeaten games keeps them on Invincibles course …. The 2014-15 Chelsea vintage are the 17th side to get into double figures of undefeated games at the start of a Premier League season but how long will they go unbeaten? Fourteen of their 16 predecessors did not get beyond 15 unbeaten games, although famously, 11 years ago, Arsenal set the ultimate standard in this regard. In the end their unbeaten run had lasted 49 games (including all 38 league games of 2003-04, read about that here) and, of course, they lost it at Old Trafford in October 2004. Only three of these unbeaten runs have been ended on home territory and Manchester United have most often been the team to bring a run to its end. Surprisingly, perhaps, United appear only once in the table below, albeit on the second best such run in the PL era, four seasons ago on their way to be Champions with only four defeats all season. November: 8 Liverpool (A); 22 West Brom (H); 29 Sunderland (A). December: 3 Tottenham (H); 6 Newcastle (A); 13 Hull (H); 22 Stoke (A); 26 West Ham (H); 28 Southampton (A). (From this distance out, the title decider at Southampton looks the biggest banana skin of those. He jested). Sunderland’s win at Crystal Palace on Monday consigned the three promoted clubs to the three Premier League relegation spots: Leicester with 9 points, QPR with 7 and Burnley with 4. That’s a total of 20 points and each club has played 10 games. In no previous Premier League season has such a small total of points been gathered at this stage by the promoted clubs. And in six of the 23 seasons promoted clubs have gained at least twice as many points. In the one season when all three promoted clubs were relegated, after 10 games 25 points had been managed: Palace had 11, Bolton 8 and Barnsley 6. This season Burnley have found points most difficult to win; they are the only side in the top seven tiers of English league football yet to record a win. But history can provide them comfort and inspiration. Only one other promoted side has gained four points at this stage of the season and that was Southampton two seasons ago, and Saints then went on to collect 37 points from their next 28 games to finish 14th. Only two promoted clubs have gained fewer points from the first 10 games. Last season Crystal Palace had three points at this stage but then they gained 42 points from 28 games to rise to 11th. The example that Burnley must seek to avoid is that of Swindon 21 years ago. They had three points from 10 games, added 27 from the next 32 games (42 games in a Premier League season back then) and still ended 13 points short of safety. Previous post "Catterick: ruthless, demanding, never courted popularity. Mr Success"